What differentiates AGM from other firms is our unique combination of services. By integrating the skills and experience of our engineering and planning staff with our land surveying staff, AGM brings greater efficiencies and service know-how to all client projects. We work as a dedicated team and as a result, projects are planned, managed and completed in a timely, on-budget manner with few surprises. As a single point of contact, we offer total responsibility and efficiency in controlling costs at every phase. That’s the AGM integrated advantage. For a quote, call us for your next project. 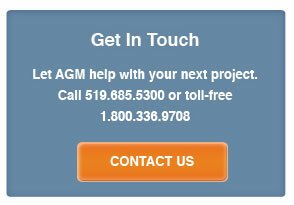 Call 519.685.5300 or toll-free 1.800.336.9708.